The hustle and bustle of Christmas can become all- consuming if we're not careful, and often families find themselves letting dinner go by the wayside in the name of marking one more stop off the to-do list. However, Nooga-Q Smokehouse & Grille has some great solutions for family takeout packages and catering if you have a big event or family gathering coming up. Nooga-Q offers full-service catering options. A catering menu is available online at Nooga-q.com, offering orders of smoked meat in bulk for groups of 10 up to 500 people. Meat choices include pulled pork, ribs, beef, pulled chicken and sliced beef brisket. Custom spreads are also an option. And to that same end, the busy mom can grab a family meal on her way home from finishing Christmas shopping or running errands. Family packs for four with a pound of meat come with a choice of three pints of sides, choice of buns or Texas toast and sauce. A family pack to feed eight includes 2 pounds of meat, three quarts of sides, choice of buns, Texas toast and sauce. Prices range from $19.75 to $38.95. And for kids who are pickey eaters, Nooga-Q has all the kid-approved standards available such as chicken fingers, macaroni and cheese, hot dogs and hamburgers. "No size is too small for us. We've catered groups from 10 to 3,000," said owner Tami Smith. "We'll do corporate catering for the same company five days in a row," Smith said. "We can create options to make sure you're getting variety. They don't want to eat barbecue every single day." More than just its menu, Nooga-Q's catering is also flexible in regards to head count and service options. And of course, if you find yourself needing a break from the family and the occasional rounds of drama that can surface, dining in at Nooga-Q is the perfect answer. Every Friday from 4 p.m. until closing, the barbecue- focused restaurant offers all-you-can-eat catfish fillets. Every Saturday, from opening to closing, it offers all-you-can-eat smoked pork ribs. 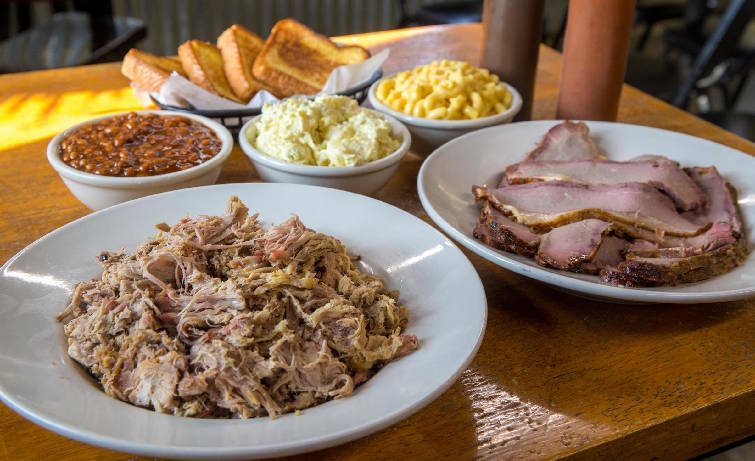 Both of these endless eats are served with toast and two sides chosen from coleslaw, baked beans, fried okra, potato salad, corn on the cob or mac and cheese. The all-you-can-eat catfish additionally comes with hush puppies, all for $10.95. Ribs are served with a drink for $14.95. "You won't go home hungry, and you'll come back again," Smith said. "We're the perfect spot to kick back and enjoy the holidays." So if you're in a hurry getting things done to get ready for the family visit, or if you just need a break once the kids are out of school, stop in at Nooga-Q for a family takeout pack or to dine in. Just have a seat and order. Either way, you're sure to get your fill and have the time you need to enjoy the season without sacrificing a hearty meal.